Skin Vitality is a Premier Provider of Ultherapy®. 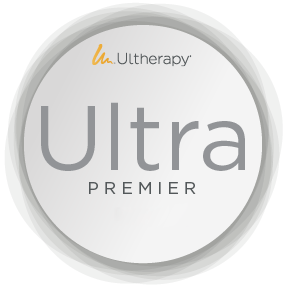 We have more than one Ultherapy® device and our entire staff has completed Ultherapy® advanced training. Make an appointment and let us give you a little lift. See what your Ultherapy® results could look like! The first thing you will want to do is schedule a one-on-one consultation. During this session, we will address your concerns, assess your skin and determine if you are a candidate for the treatment. After cleansing the skin and identifying the specific areas to be treated, we will apply the ultrasound gel and place the smooth treatment applicator against your skin. Next, we use Ultherapy’s ultrasound imaging to first see deep within the skin to determine optimal placement of the treatment energy, and then deliver the focused ultrasound energy beneath the skin’s surface. The length of your treatment will depend on the area being treated and your individual treatment plan. A face* and neck procedure typically takes 60-90 minutes, while a chest treatment takes approximately 30 minutes. *Face refers to treatment of two or more of the FDA-cleared areas of the neck, brow, and under the chin. With Ultherapy, there is little-to-no downtime! You can return to your normal activities immediately after your procedure without any post-treatment restrictions or requirements. Other, less common post-procedural effects may include temporary bruising or numbness on small areas of skin. As with any medical procedure, there is the possibility for other rare effects, which we will review with you. A good candidate for Ultherapy is someone with some degree of laxity, to the point of looking, and often feeling, less firm. Loose skin under the neck and under the chin, or lines and wrinkles on the chest, are signals a patient might be a candidate. Typically, those in their 30s and older who have mild to moderate skin laxity are candidates. * While Ultherapy is not a replacement for a surgical facelift, there are many people who want some facial lifting but are not ready for surgery, whether mentally, physically or financially. There also are younger people who want to "stay ahead of the game," as well as patients wanting an aesthetic maintenance option. The majority of patients only need one treatment; however, some may benefit from more than one treatment, depending on how much skin laxity they have and their body’s own biological response to the ultrasound and the collagen-building process. Ultherapy requires little-to-no downtime. After your procedure, you can resume normal activities quickly without having to follow special post-treatment measures. What does Ultherapy treatment feel like? As the ultrasound energy is delivered, you may feel tiny amounts of energy being deposited to precise depths, stimulating the collagen-building process. Comfort levels vary from person to person, but the sensation only lasts while the ultrasound energy is being delivered. After your Ultherapy® treatment, you may see some initial effect, but the ultimate results could take place over 2-3 months as the body naturally regenerates collagen. Since the procedure stimulates the collagen production, the time the results may last can vary. The treatment produces new collagen on the inside, but your natural aging process can dictate how long that translates into results on the outside. Most patients may only need one treatment. However, based on the degree of skin laxity, the biological response to the ultrasound energy and the individual’s collagen-building process, some patients can benefit from additional treatments. Because skin continues to age, future touch-up treatments can help patients keep pace with the body’s natural aging process. * MacGregor JL, Tanzi EL. Microfocused ultrasound for skin tightening. Semin Cutan Med Surg. 2013;32:18-25.